Textile Stock - Shares latest News of the textile Industry: How Simple Is It to Buy and Sell Goods from TextileStock.In! For those who are unaware of what exactly TextileStock.in is, it is an online inventory of textile stock in India that is ready to be sold. This portal works on the simple principle of availing all the requisite information regarding a stocklot on sale so that the buyer can make an informed choice, and the seller can get a fair price for the material. And all of this with a few simple clicks of the mouse. TextileStock.in essentially offers its services, free of cost, so that the maximum number of interested sellers and buyers can trade in the requisite stocklot with complete ease. Let us understand this entire system in brief. The site maintains an exhaustive database of the textile stock of India, the details of which can be accessed freely by all internet users alike. Moreover, constant search for newer stocks is conducted by maintaining regular contact with various suppliers and customers so that the interested buyers can have access to the latest stocks in the market. For those who wish to have further clarity on the exact procedure, here’s how it all happens . Their are two ways ways by a which a buyer can avail services of Textilestock.in for free. An interested buyer can submit his request with details of textile goods that he is on the lookout for. Next, suppliers accredited by TextileStock.in can submit the approximate quotation for the buyer’s request. On the receipt of buyer’s approval of the quote, TextileStock.in helps the two interested parties in closing the deal. That being done, the textile goods are then shipped to the buyer as and when required. 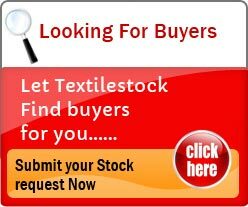 Textilestock.in experts review the stock available and if it’s export worthy, advise all details including prices to the buyer. Once the prices b/w the two parties are agreed upon textilestock.in takes control of the merchandize and checks it thoroughly to make sure it’s export quality. Once thorough checking is done, the goods are packed as per buyer specifications in Textilestock.in’s own warehouses across India and shipped to the buyer. By being a part of the entire process and taking control of all the important aspects ( as above) of the deal Textilestock.in ensures a fair deal for all parties involved. A supplier gets good value for his stock and a buyer gets excellent “A” grade goods at a discounted price packed as per his requirement.